Wow, this Summer is flying by! We’re nearly 2/3 the way through it and we hope you are making the most of the warm (ok, SIZZLING HOT) weather. Tons of stuff to do this weekend – some indoors, some outdoors. If you’re heading out, remember the sunscreen and the bug spray! Our picks for this weekend? 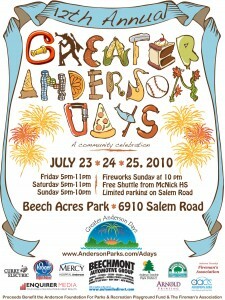 Greater Anderson Days are celebrated all weekend at Beech Acres Park in Anderson Township! Family fun all day, every day during the 12th annual festival brought to you by the Anderson Township Park District, Anderson Township Fireman’s Association, the Anderson Area Chamber of Commerce and the Anderson Township Government. Games, rides, vendor exhibits and more – something for everyone in your crew! The Beach Waterpark has a ton to offer. Not only do you get the awesome wet & wild, but Friday night they’ll have a 60’s band there to perform for SURF ROCKIN’ FRIDAYS. Or head out on Saturday for more live music and once the sun goes down watch “The Blind Side” for this week’s DIVE IN MOVIE. All the details on these events can be found at their site. P had her birthday at Pump It UP last year and still talks about it to this day. And since we can’t throw birthday parties EVERY WEEKEND (P doesn’t agree, but whaddayagonnado? 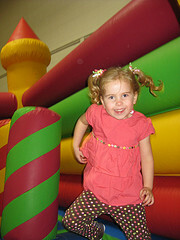 ), I love it when Pump It UP hosts drop in parties at their awesome facility! Friday from 7-8:30 the whole family can get their jump on at the West Chester location. Kids are only $10 each and in addition to the bouncing, there will be karaoke, hula hoop and limbo contests – games, prizes and more! As always us grown-ups are FREE and encouraged to PUMP IT UP right along side the kids! It is highly recommended that you call and register your kids beforehand so you don’t miss out on a spot! 513.829.7867 – you will need a signed waiver for each child and everyone is required to wear socks – a small price to pay for this fun. Saturday – Hike Among The Great Oaks at Winton Woods Great Oaks Trail @ 9:00 a.m. Walk among the tall, old oak trees and other forest habitat. We will walk less than a mile and keep an eye out for wildlife and other interesting natural features. Sunday – Morning Summer Strolls at Farbach-Werner Nature Preserve Pin Oak Trail @ 9:00 a.m.
Sunday – Rollin’ On The River Charity Car Show at Fernbank Park 9:00 a.m. – 4:00 p.m. The Riverview Delhi Kiwanis host the 21st annual charity car show that will feature hundreds of antique and collectable cars. View details here. 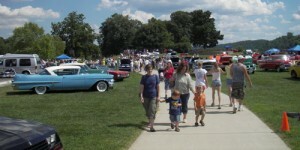 Sunday – It’s sizzlin’ all right, so Beat the Heat at Winton Woods Harbor @ 2:00 p.m. Discover how animals survive the summer…without air conditioning! We will play some games to keep ourselves “cool”, too. Wear clothes that can get slightly wet. Sunday – Woof Walk at Sharon Woods Kreis Dam @ 2:00 p.m.
Bring your dog and your walking shoes for this program! Join the naturalist for a hike along the Gorge and Parcours trails and learn a little about historical and modern day canines along the way. All dogs must be on a leash shorter than six feet and make sure to bring a plastic bag for easy clean-up! Don’t forget some drinking water for your pooch too! Bonnybrook Farms continues their CHUCKWAGON DINNERS this Saturday (and every Saturday in the Summer). Read Kristin’s post from earlier this month for all the information. My family hopes to get there in a couple weeks, they look like a ton o’ fun! The 2010 Warren County Fair is Friday and Saturday!! The 160th Butler County Fair starts on Sunday and runs through the 31st!! And looking ahead: Boone County Fair is August 2-7; Hamilton County Fair is August 10-14; the Ohio State Fair is July 28-August 8; and the Kentucky State Fair wraps up the Summer fair season August 19-29! Mason’s Movies in the Park continue Saturday at Cottell Park. 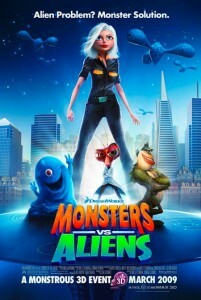 This week’s feature is Monsters vs. Aliens is one of our favorites! Pack some snacks and enjoy the flick surrounded by nature! 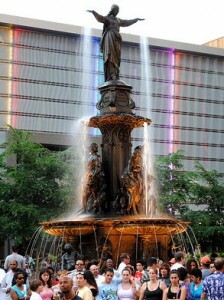 Introduce your children to the game of tennis – Saturday on Fountain Square from 1pm to 4pm, experts will be on hand to give the whole family the ins & outs of the game. This promotional event is sponsored by the United States Tennis Association, just in time to get us all ready for the 2010 Western & Southern Financial Group Open coming up in Warren County in August! If you love baseball in a fun, family-friendly environment, Florence Freedom is the place for you! They are home this weekend taking on the Evansville Otters – Friday 7:05 and Saturday 5:00. We’re using our GROUPON deal on Saturday night – can’t wait! St. Ann’s Festival is this weekend in Hamilton. Live music and all the festival fun you can handle – Friday thru Sunday. Contact them for details. You all know my family loves Whole Foods – their kids cooking classes continue on Saturday. Check their site or our posts for more details and information on registering your little ones for these FREE and TERRIFIC classes. P and I will be there on Saturday at Rookwood, so say hello if you go! The Betts House on Clark Street is only open two Saturdays a month and this Saturday is FAMILY DAY there. They are open 12:30-5 and you can find all the details on their site. How about a little Shakespeare on Friday? Enjoy “A Midsummer Night’s Dream” at Burnet Woods Bandstand Friday at 7pm. Toyota’s Movie Night on the Square is Saturday – Cloudy With A Chance of Meatballs kicks things off at 7pm, followed by Where the Wild Things Are. 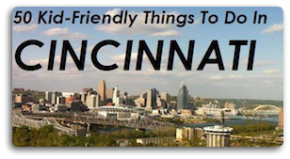 There is a TON of stuff to do at The Cincinnati Museum Center at Union Terminal all weekend – click here for all the details. LM&M Railroad is always fun and this weekend they are honoring the brave souls of the Civil War. Take a 30-minute train ride to the LM&M Junction and walk through a live Civil War encampment with demonstrations, re-enactors and more. Saturday 10am, 1pm and 4 pm and Sunday 1pm and 4pm – we recommend calling for reservations – these rides often sell out! Family Saturday at Contemporary Arts Center – CAC staff will show you how to make a personalized tote bag using printing techniques, fabric markers and other materials, all inspired by Shepard Fairey’s art. Contemporary Arts Center, 44 E. Sixth St.; 1 – 2 p.m.; free members, free with admission non-members ($7.50 adults, $4.50 ages 3 – 13). I’m hoping we can squeeze this one in cause you can NEVER have too many tote bags! Head to Cincinnati Nature Center at Long Branch Farm and Trails (Goshen) on Sunday at 9:30pm for a Moon Walk! Children 8 and older will wonder the trails at night under the full moon followed by some natural history readings under the stars. Visit their website for more details. I have been browsing online greater than 3 hours lately, but I never found any attention-grabbing article like yours. It is beautiful value sufficient for me. In my view, if all site owners and bloggers made good content material as you probably did, the net will probably be a lot more helpful than ever before.